Investigative music documentary by recording artist & filmmaker Ken Goldstein tells the story of a song and a town that was 30 years in the making; public invited to attend free 8 p.m. screening. BETHLEHMEHM, PA–Thirty years ago, as a student at Syracuse University, Chicago native and aspiring musician Ken Goldstein visited the Buffalo area and got a glimpse of how the closing of the local steel mill in Lackawanna, N.Y. put thousands out of work and gutted a community. In the ensuing days, he penned a song, “Bethlehem Steel,” that he’s carried with him throughout his career. Now the frontman for Los Angeles-based touring band The LA Hustle, Goldstein last summer visited another former one-industry town – Bethlehem, Pa. – and got an entirely different take on what it means to be an ‘old’ steel town. Performing on opening night of Musikfest, the musician was inspired to once again pick up his pen and his guitar, breathing new life into the song he first wrote three decades ago. The result is “The Song of Bethlehem,” a song of triumph over tragedy and the power of ‘community’ in overcoming obstacles. 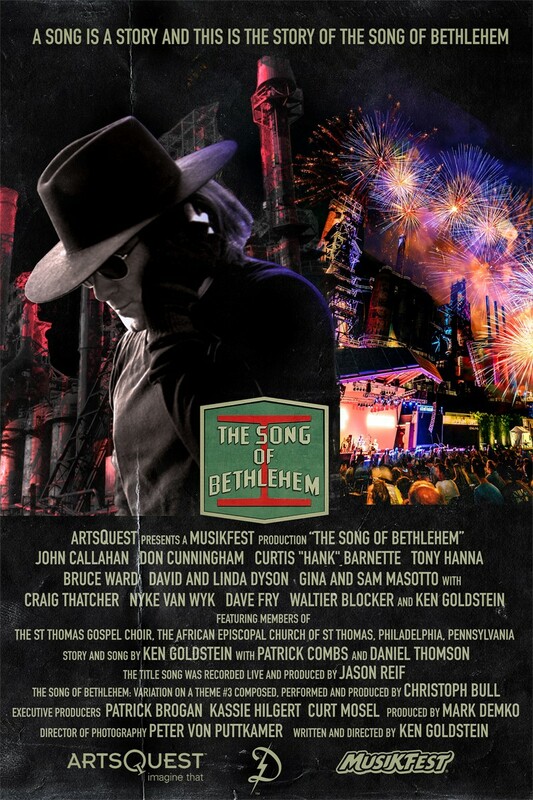 On March 18, 8 p.m., the ArtsQuest Center at SteelStacks will host the World Premiere of the 30-minute documentary film “The Song of Bethlehem,” which tells the story of Goldstein’s return to the Christmas City last December to lay down the vocals and music for “The Song of Bethlehem,” in the place it was meant to be recorded – on the old Bethlehem Steel plant on the city’s SouthSide. The singer-songwriter took up residence in the former Steel Turn & Grind Shop at SteelStacks, recording a new version of the song with renowned Lehigh Valley musicians Craig Thatcher, Nyke Van Wyk and Dave Fry, along with The St. Thomas Gospel Choir of the African Episcopal Church of St. Thomas in Philadelphia. In the days that followed, Goldstein, along with noted filmmaker Peter Von Puttkammer, whose credits include “BIGGEST & BADDEST” (Nat Geo WILD), “Killing Bigfoot” (Discovery’s Destination America) and “Lost in the Amazon: The Enigma of Col. Percy Fawcett” (PBS), spent hours interviewing the people and the organizations responsible for the transformation of the old steel mill into SteelStacks. Included in the documentary are interviews with former Bethlehem Mayors John Callahan and Don Cunningham; ArtsQuest President & CEO Kassie Hilgert; Bethlehem Redevelopment Authority Executive Director Tony Hanna; Curtis “Hank” Barnette, the last chairman of The Bethlehem Steel; former steelworkers and more. During his career, Goldstein has worked as a photojournalist for The New York New Times, writer for The Chicago Tribune and as a television news commentator and field reporter for FOX News and NBC. He also wrote, directed and produced television for A&E Network, The History Channel, BET, TF-1, BBC, PBS, Fox Broadcasting Company and NBC. In the coming months, Goldstein plans to take “The Song of Bethlehem” film to select film festivals across the nation, coupling the screenings with performances where possible, to help share the story of how one former industrial town found success in the aftermath of its largest employer closing. This summer, Goldstein will also return to the Lehigh Valley as ArtsQuest’s 2018 Artist in Residence, performing at the Levitt Pavilion Summer Concert Series and at Musikfest. Free tickets to ‘The Song of Bethlehem’ premiere March 18, 8 p.m., can be requested in advance by calling ArtsQuest at 610-332-3378 or visiting the ArtsQuest Center at SteelStacks. Donations are welcome, with all contributions helping to underwrite the production of the film. “Avatar – The Last Airbender: The Complete Series” available on Blu-ray nationwide on June 5!